The event has grown over the years in tandem with the market. Event Date : 10 - 11 SEPTEMBER 2018. World Drug Safety Congress Europe was the first strategic pharmacovigilance event to unite a plethora of stakeholders in drug safety, from pharma and biotechs to regulators and patients. The event continues to lead the way in moving the sector forward and has been running for over a decade. It is world renowned for its ability to connect key stakeholders and grow the industry. The event has grown over the years in tandem with the market. 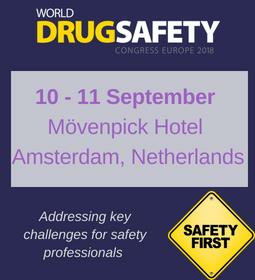 World Drug Safety Congress Europe is the only forum where you can discuss drug safety solutions, meet future clients and begin new partnerships. On the back of our successful European show, we brought the event to the States in 2008 and will hold our 10th Americas meeting in Philadelphia next year. All our clients return year-on-year to showcase their solutions to our senior level audience. We are constantly revamping our content, formats and topics to stay ahead of market needs which enables us to deliver the best drug safety event in the marketplace today. New for this year, we will focus on big data management in drug safety and new data sources which will help us to build on the diversity of perspectives and organisations represented. We have welcomed over 1650 senior level drug safety professionals to the event over the years. If you are interested in attending, make sure to register today and benefit from the 15% partner discount.